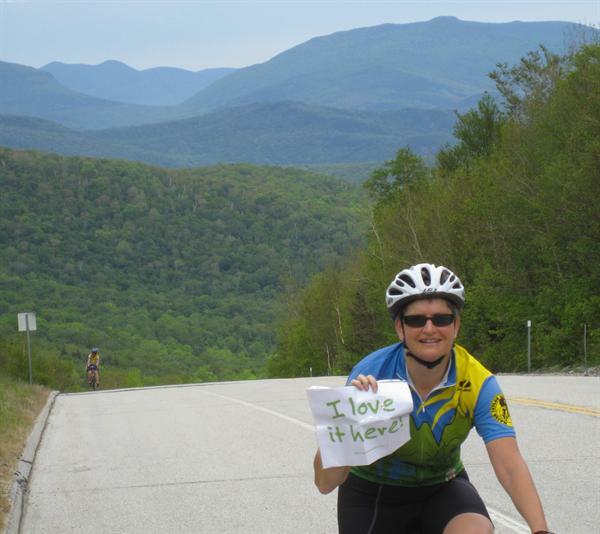 Put a bicyclist on the NH tourism map! OK, this is a stretch. My friend, Lynne Tolman who works too hard running the Major Taylor Association an’ stuff in Massachusetts, is competing for the “I LOVE IT HERE” New Hampshire photo contest. If you want to drop kick a cyclist into first place, you have to finish reading this, click and vote for Lynne T. holding a paper sign. Then she’ll stop nagging me, saying that I’m personally responsible for her ah…not winning this contest. Bear in mind, the guy in front of the NH capitol is ahead by some votes, and she wants to put him in the gutter, and beat him by a tire’s width. Oh, wait a minute…. The top vote getter is simply “eligible to win”. Damn, I missed the fine print. ~ by jacquiephelan on June 8, 2010. Awesome! This is the kind of viral thing we want to happen with our summer promotion, the NH Dream Vacation Photo Contest! Keep plugging along…the contest runs until Labor Day and includes five prizes of $500 for the top popular vote pictures. Go to http://www.nhdreamvacation.com to enter! I love how you reason things out as you go along. Lynne has pulled ahead by a nose…she’s got out her suitcase of courage and she’s going for it all! Jacquie, I understand how the word “eligibile” threw you, but methinks they’re just hedging in case of a tie, or in case the judges pick one of the top 5 vote-getters as the grand prize winner, or in case a top vote-getter can’t be reached for confirmation. See, 1 grand prize winner ($2500 in NH vacation bucks, restrictions apply) is picked by judges, based on photo quality. Then 5 top vote-getters (doesn’t say THE top 5) each get “First Prize,” which is $500 NH vacation bucks. I’m getting all this from the link for Official Rules. So please vote for my Kinsman Notch photo! You can vote once every 24 hours, through Sept. 6. The Bike-Walk Alliance of New Hampshire has taken notice. My photo is a winner! First place, popular vote. I got 14,061 votes, more than all the other winners combined. Many thanks to Jacquie for getting the word out and to everyone who voted.